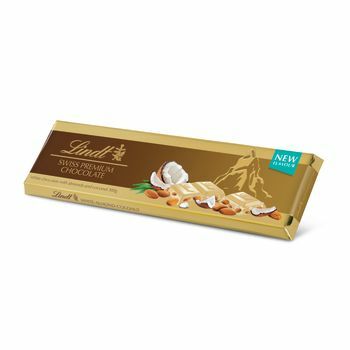 The limited Lindt Gold Bar 300g White Coconut Almond is a refreshing treat of sweet creamy white chocolate with fresh coconut flakes and aromatic roasted almonds. A tropical chocolate delight to celebrate summer. Presented in a golden premium packaging, it is the perfect gift for any occasion, as well as an extra-special treat to buy for oneself.